I hope to have multiple pictures to share with you soon. I spent the last two weeks in both Israel and the West Bank. This was an amazing opportunity to walk on the same streets that Jesus did. Seeing first hand the conflict is this part of the Middle East brought a whole new prospective for me on church security. 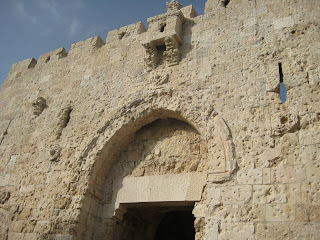 This is a picture of the Zion Gate, part of the original wall of Jerusalem. Following the theme of this blog - "The Gatekeeper" - it was a great opportunity to see these places first hand.